We continue the discussion on breast cancer awareness and treatment with the genetics of the disease. Can the work of identifying the genes which increase the risk of breast cancer help in it early detection and possible prevention? Michael Robinson talks to author Jeanne Dockins about this. 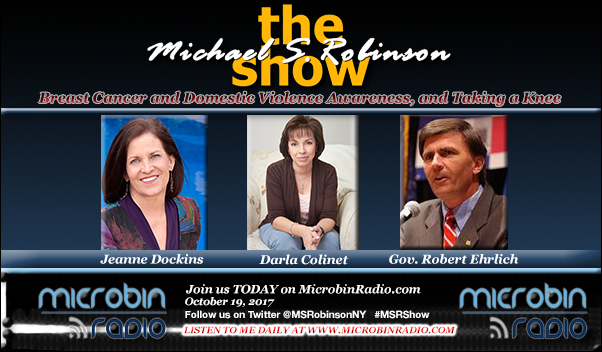 October is also Domestic Violence Awareness month and to bring some light to this societal problem, Michael talks to author Darla Colinet who was married to her abuser for 30 years. Finally Michael tackles the issue of NFL players taking a knee in protest with former Maryland governor Robert Ehrlich. Darla Colinet – Christian speaker; author, Who’s Writing Your Life’s Story?